You should know that I don’t even like olives. But when Rebecca brought these over on Thanksgiving, I ate as many of these as I could politely consume. Then, when no one was looking, I ate some more. The beauty of this these olives is that you can use pretty much any sharp cheese–from processed spread to high-end grated–and the results are always great, so it’s the ideal way to use up leftovers from a party–you could even use a leftover cheese log, nuts and all. This whips up in minutes and looks like it took a lot of work. The recipe doubles or triples easily. Prepared, unbaked olives can be frozen, tightly wrapped, for up to a month. Thaw briefly and bake as directed. Preheat oven to 350 degrees. Drain olives and pat dry. Thoroughly combine cheese and butter. Add flour and cayenne, stirring to fully mix. When thoroughly combined but crumbly, work mixture together with your fingers to form dough (no need to knead–it will stick right together). Roll a tablespoon-sized clump of dough into a ball. Press it flat between the palms of your hands. 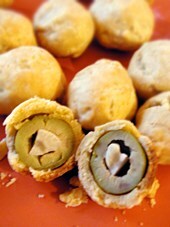 Put an olive in the center and press dough around sides to enclose. Simply close your hand around the olive and the dough will enclose most of it. Then just push the edges together to cover the olive. Roll it between your palms to smooth surface, if you like. Bake 15 – 20 minutes. Serve warm or at room temperature. This entry was posted on Wednesday, September 5th, 2007 at 7:00 pm	and is filed under Appetizers, Master Recipe Index, Party Food & Snacks, Speed Queen (30 min/less), Vegetarian. You can follow any responses to this entry through the RSS 2.0 feed. You can leave a response, or trackback from your own site.